This is a very authentic Bangladeshi dish by Celebrity Chef Kiran Jethwa. To a pan add bay leaf, cinnamon, cloves, cardamon, and cumin seeds, and fry in hot mustard oil to release their aromas. add chopped onions then cover and sweat down. Add chopped tomatoes, two teaspoons of powdered coriander, a sprinkle of chilli powder and a drizzle of honey to balance the flavour. For extra spice ,throw in crushed garlic, chilli and ginger and leave to cook down on a low heat. Season with salt and set aside. For added texture , deep fry some finely sliced red and green aubergines until a lovely golden colour. Into a large pan, add a layer of the uncooked, fried rice, followed by a layer of the deep aubergines. Add a good scoop of the prawn and mango, then top with more rice. 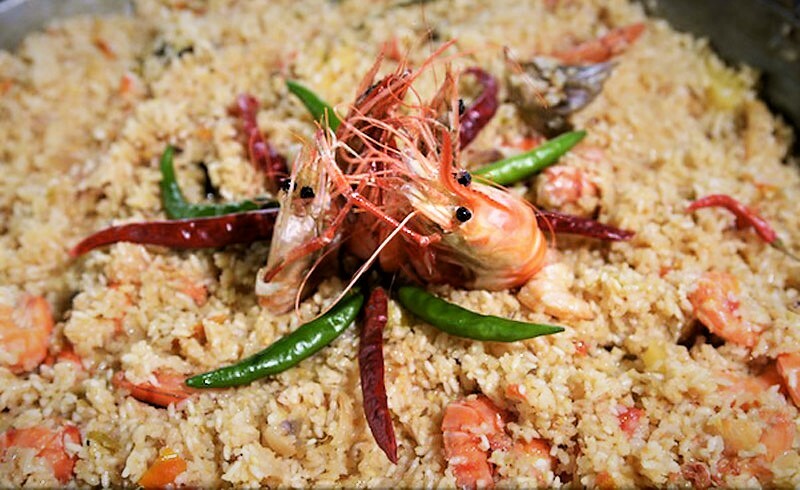 Repeat this process till you have multiple layers and all your rice and prawn mixture is used up. For added colour, chop half a dried turmeric and dot it within the pilau. Continue the layering process until the pan is full. Bring this to a boil, then reduce the heat and allow to gently steam until all the water has been absorbed and the rice is beautifully cooked.